Heat shock protein (HSP) 60 nonspecifically activates cells of the innate immune system. In the present study, we characterized the effects of human HSP60 maturation, cytokine release, and T cell-activating capacity of bone marrow-derived dendritic cells (DC). Furthermore, we analyzed HSP60-induced signal transduction in DC. HSP60 strongly stimulated DC for maturation and release of TNF-α, IL-12, and IL-1β. However, HSP60 elicited only a weak IL-10 response in DC suggesting a Th1 bias. 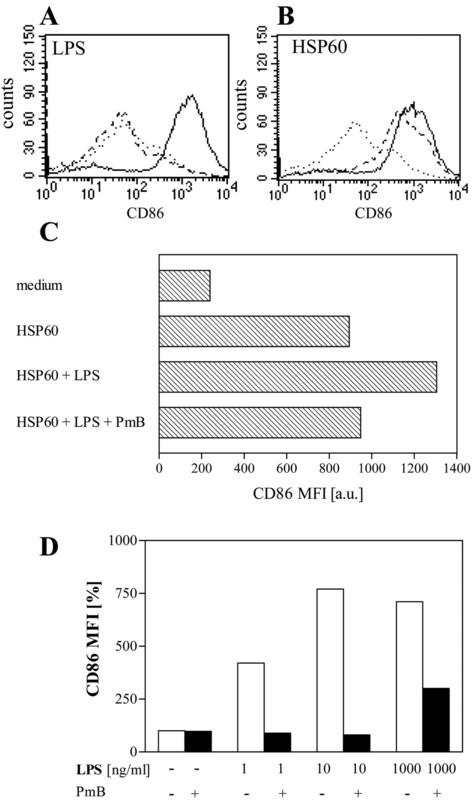 HSP60-treated DC induced proliferation of allogeneic T cells. Again, a Th1 bias was noted in that cocultures of allogeneic T cells and HSP60-treated DC released IFN-γ but only small amounts of IL-10 and no detectable IL-4. Signaling via Toll-like receptor 4 was involved in HSP60-induced cytokine release and maturation because DC of C3H/HeJ mice with a mutant Toll-like receptor 4 showed deficient response to HSP60. HSP60 was found to rapidly activate the mitogen-activated protein kinases p38, c-Jun N-terminal kinase, and extracellular signal-regulated kinase as well as IκB in DC. Phosphorylation of these signaling molecules was also mediated by LPS, but with much slower kinetics. Thus, HSP60 stimulates DC more rapidly than LPS and elicits a Th1-promoting phenotype. These results suggest that DC play a pivotal role in priming for destructive Th1-type responses at sites of local HSP60 release. Heat shock proteins (HSPs)4 are highly conserved molecules that act as chaperones involved in correct folding of newly synthesized proteins (1, 2). In addition, they transport Ags and after internalization they mediate Ag-specific cytotoxic T cell (3, 4, 5), as well as Th cell-dependent, responses (6, 7, 8). HSP60 with a molecular mass of 60 kDa is mainly expressed in mitochondria (9). During stress, synthesis of HSPs is up-regulated in prokaryotic, as well as in eukaryotic, cells. Moreover, an intracellular redistribution of HSP60 and the expression of these molecules on the cell surface has been reported (10, 11, 12). Recently, the stimulatory capacity of extracellular HSP60 on the innate immune system has been recognized. Human and murine macrophages respond to both bacterial and human HSP60 with the release of proinflammatory mediators such as TNF-α or IL-6 (13, 14) and of the Th1-promoting cytokines IL-12 and IL-15 (13) suggesting that HSP60 might act as a “danger signal” for the innate immune system. The cell surface receptor for HSP60 has not yet been completely characterized. However, there is evidence that CD14 (15) and Toll-like receptors (TLR) 2 and 4 (16, 17) are involved in HSP60-mediated cell activation. However, binding to macrophages appears to be TLR4-independent (18). Recently, a first report on HSP60-induced signaling pathways in macrophages has been published indicating that the stress-activated protein kinases c-Jun N-terminal kinase (JNK) and p38 mitogen-activated protein kinase (MAPK), as well as IκB kinase, are activated after endocytosis of HSP60 by murine macrophages (17). These kinases induce transcription factors like NF-κB that are responsible for cytokine (e.g., TNF-α) gene transcription. Interestingly, HSP60 is also an Ag for the adaptive immune system and T cell responses to HSP60 epitopes regulate inflammatory diseases like rheumatoid arthritis, insulin-dependent diabetes mellitus, and artherosclerosis (19, 20, 21, 22). Indeed, autologous HSP60 has been suggested to control the balance of T cell responses in inflammation and autoimmunity (23). Activation of T cells is induced through their interaction with APC, like dendritic cells (DC). DC reside in an immature form in nonlymphoid tissues where they efficiently capture foreign Ags. Upon activation by pathogens or by inflammatory stimuli like TNF-α or IL-1β, DC migrate to lymphoid organs where they potently activate Ag-specific T cell responses (24, 25). During migration, DC undergo functional and phenotypic changes termed as “maturation.” They up-regulate surface molecules like MHC class I and II molecules, CD86, CD40, and CD54, and, thus, become potent inducers of T cell activation. Maturation is further driven by CD40-CD40 ligand interaction upon contact of DC with T cells (26). In parallel, DC lose their capacity for endocytosis and de novo MHC class II synthesis during migration to the lymphoid tissues (27, 28). This feature enables DC to preserve the Ag taken-up in the periphery for Ag-specific T cell activation. In addition, mature DC are able to release high amounts of proinflammatory cytokines like TNF-α or IL-1β and of the Th1-promoting cytokines IL-12 and IL-18 but they also secrete counterregulatory IL-10 (26, 29, 30, 31). Therefore, DC are not only unique in induction of naive T cell activation but also play a decisive role in Th cell polarization. In the present study, we investigated how mammalian HSP60 might exert its potent immunostimulatory capacity. Based on the extraordinary role of DC in induction of primary T cells, we analyzed the modulation of immature DC by human HSP60. Surface expression of costimulatory molecules, cytokine production, and the activation of naive T cells were examined. In addition, potential signaling pathways used by HSP60 in DC were identified. Very low endotoxin RPMI 1640 (Seromed, Berlin, Germany) containing 10 mM HEPES (Seromed), 2 mM L-glutamine (Seromed), 20 μg/ml gentamicin, 60 μg/ml penicillin, 50 μM 2-ME, and 10% heat-inactivated FCS (all from Sigma-Aldrich, Deisenhofen, Germany) was used as culture medium (CM). For stimulation of bone marrow-derived DCs (BMDC), Escherichia coli strain O26:B6 LPS (Sigma-Aldrich) and recombinant human HSP60 (kindly provided by Peptor, Rehovot, Israel) were used. The endotoxin content of HSP60 used in this study was 0.05 endotoxin units (equivalent to 5 pg of LPS) per microgram of protein as determined by Limulus amebocyte lysate (LAL) assay (BioWhittaker, Verviers, Belgium). For pretreatment with polymyxin B (PmB), 1–1000 ng/ml LPS and/or 10 μg/ml HSP60 were incubated with 10 μg/ml PmB (Sigma-Aldrich) for 1 h at room temperature before addition to the cell cultures. For heat denaturation, LPS or HSP60 was incubated at 95°C for 20 min. For protein digestion, LPS or HSP60 was incubated in CM without FCS with 14 mg/ml proteinase K coupled to agarose beads (Sigma-Aldrich) in glass tubes (BioWhittaker). After incubation at 37°C for 3.5 h, the agarose was pelleted by centrifugation at 100 × g for 1 min, the supernatant was diluted to a final concentration of 10 ng/ml LPS and 10 or 30 μg/ml HSP60, respectively, and used for stimulation of BMDC. As control, LPS and HSP60 were treated identically with protein G-agarose beads (Sigma-Aldrich). BMDC were generated as described previously (32). Briefly, bone marrow cells were flushed from tibiae and femurs of 7- to 8-wk-old female BALB/c (Bomholtgard, Ry, Denmark), C3H/HeN, or C3H/HeJ (Harlan Winkelmann, Borchen, Germany) mice and seeded at 2 × 106 cells in bacteriological Petri dishes (100-mm diameter; Falcon, Heidelberg, Germany) in a volume of 10 ml of CM containing 20 ng/ml GM-CSF (Peprotec, Frankfurt, Germany). On day 3, 10 ml of CM containing 20 ng/ml GM-CSF was added to the dishes. On day 7, 10 ml of the cultures were removed, centrifuged, the pellet was resuspended in 10 ml fresh CM containing 20 ng/ml GM-CSF and was given back into the same dish. On day 9, nonadherent cells contained 85–92% DCs or their progenitors (CD11c+), <0.5% macrophages (CD14+CD11c−), and <5% granulocytes (Ly6G+). Nonadherent cells were harvested and 1 × 106 BMDC were seeded in 1 ml of CM supplemented with 10 ng/ml GM-CSF per well (24-well plate) and stimulated or not with various doses of LPS or HSP60. After 18 h, nonadherent cells were harvested and used for FACS analyses. Supernatants were used for cytokine determination. Cytokine contents were determined using ELISA for TNF-α, IL-10, IFN-γ (all OptEIA kits; BD PharMingen, Heidelberg, Germany), IL-1β and IL-12(p40) (both DuoSet; R&D Systems, Wiesbaden, Germany), and IL-12(p70) (Quantikine; R&D Systems) following the manufacturers’ instructions. The detection limit was 16 pg/ml for TNF-α, IFN-γ, IL-12(p40), IL-10, and IL-1β, and 8 pg/ml for IL-12(p70). CD3+ T cells were purified from C57BL/6 spleen cells using T cell enrichment columns (R&D Systems) according to the manufacturer’s instructions. For proliferation assays, triplicates of 1.5 × 105 enriched T cells were seeded together with titrated numbers of mitomycin C-treated BMDC (50 μg/ml, 20 min, 37°C; Sigma-Aldrich) in a total volume of 150 μl of CM supplemented with 10 ng/ml GM-CSF per well (96-well flat-bottom plate). After 3 days, cells were pulsed with 1 μCi [3H]thymidine (Amersham Pharmacia Biotech, Uppsala, Sweden) per well overnight. Incorporation of radioactivity was determined using a 96-well microplate beta-counter (Canberra-Packard, Dreieich, Germany). For cytokine analyses, duplicate cultures of 6 × 105 enriched T cells together with 1.2 × 105 mitomycin C-treated BMDC in a total volume of 600 μl were set up in a 24-well plate. After 3 days, supernatants were harvested and used for ELISA. After blocking unspecific binding sites with FcBlock (BD Biosciences, Mountain View, CA), 2–4 × 105, BMDC were stained in FACS Wash (BD Biosciences) for 30 min on ice with saturating amounts of the following Abs (all purchased from BD Biosciences): FITC-conjugated anti I-Ad (catalog no. 553623) or I-Ak (catalog no. 553540), PE-conjugated anti-CD86 (catalog no. 553692) or anti-CD54 (catalog no. 553253), and biotinylated anti-CD40 (catalog no. 553789). After washing twice with FACS Wash, the cells were incubated with streptavidin-conjugated CyChrome (catalog no. 554062; BD Biosciences) for 30 min on ice. As isotype control, appropriate subclass Abs were used. Cells were washed twice, fixed with 1% paraformaldehyde, and analyzed using a FACSCalibur (BD Biosciences) and CellQuest software (BD Biosciences). Quadrants in dot plots were set at the fluorescence intensity where the number of false-positive cells of isotype controls was <5% of all cells tested. For preparing cytoplasm extracts, cells were harvested, centrifuged at 300 × g, and the pellet was resuspended in ice-cold 0.5% Na3VO4 in PBS. After centrifugation, the pellet was resuspended in 50–100 μl of sucrose buffer (0.32 M sucrose, 10 mM Tris-HCl, pH 8.0, 3 mM CaCl2, 2 mM MgOAc, 0.1 mM EDTA, 0.5% Nonidet P-40, 1 mM DTT, 0.5 mM PMSF) and incubated, slowly rotating at 4°C overnight. After centrifugation for 15 min at 14,000 rpm in an Eppendorf centrifuge, the supernatant was harvested and the protein concentration was determined by DC-Protein Assay (Bio-Rad, Munich, Germany). Twenty micrograms of protein of cytoplasm extracts were subjected to 7% SDS-PAGE and transferred to nitrocellulose membranes for Western blot analysis (Bio-Rad). Membranes were blocked using blocking reagent (Roche Molecular Biochemicals, Mannheim, Germany) before incubation with specific Abs against the phosphorylated forms of IκB, extracellular signal-regulated kinase (ERK) 1/2, p38 MAPK, raf-1, and JNK (all from Cell Signaling Technology, Frankfurt, Germany) for 1 h at room temperature. After five washes, peroxidase-labeled goat anti-rabbit IgG polyclonal Ab (Roche Diagnostics, Mannheim, Germany) was added for 30 min at room temperature. After five washes, blots were developed using chemiluminescence HRP substrate (Roche Diagnostics) for 5 min. After detection, the membranes were stripped in Restore Western blot stripping buffer (Pierce, Rockford, IL) for 30 min at 37°C. After washing with distilled water, membranes were dried and stored at 4°C for further use. To test whether HSP60 might effect the expression of surface markers involved in maturation, BMDC from BALB/c mice were cultured in the presence of LPS or 0.3–30 μg/ml HSP60. After 18 h, nonadherent cells were harvested, stained with Abs against MHC class II molecules (I-Ad), CD86, CD40, CD54, and with the appropriate isotype controls for FACS analyses. For reasons of clarity, the mean fluorescence intensities of each staining are shown. LPS induced BMDC maturation as evident from increased expression of the costimulatory molecules CD86 (6.7-fold) and CD40 (9.2-fold) as compared to controls (Fig. 1⇓, B and C). Surface expression of I-Ad and CD54 was up-regulated 2- and 3.3-fold (Fig. 1⇓, A and D). When cultured in the presence of HSP60, BMDC also showed signs of maturation, i.e., there was up-regulation of I-Ad, CD86, CD40, and CD54 on the cell surface (Fig. 1⇓, A–D). The maturation signal delivered by HSP60 was dose-dependent with minor effects at 0.3 μg/ml and the most prominent effects at 30 μg/ml HSP60, reaching values similar to treatment with 1 μg/ml LPS. Expression of surface molecules on BMDC after stimulation with LPS or HSP60. BMDC were prepared from BALB/c mice and were treated or not with 1 μg/ml LPS or 0.3–30 μg/ml HSP60. After 18 h, nonadherent cells were harvested, stained for I-Ad (A), CD86 (B), CD40 (C), or CD54 (D), and analyzed by FACS. The data show the mean fluorescence intensity (MFI) and are representative for five experiments. Numbers above bars indicate fold increase when compared to medium control. The two major and partially independent surface changes during the maturation of DC are the up-regulation of costimulatory molecules and of MHC class II molecules. We analyzed the association of these two parameters in the response of BMDC to HSP60 vs LPS (Fig. 2⇓). The population of untreated BMDC was heterogeneous showing immature DC (MHC IIlow) that were at least slightly positive for CD86 and CD40 as well as already mature cells (MHC IIhigh) which were also CD86high or CD40high. The percentage of MHC IIhighCD86high and MHC IIhighCD40high DC was strongly enhanced by 10- and 8-fold, respectively, after stimulation with LPS. Treatment with HSP60 clearly increased the mature subpopulation represented by MHC IIhighCD86high and MHC IIhighCD40high DC by 8.9- and 7.9-fold, respectively (Fig. 2⇓). 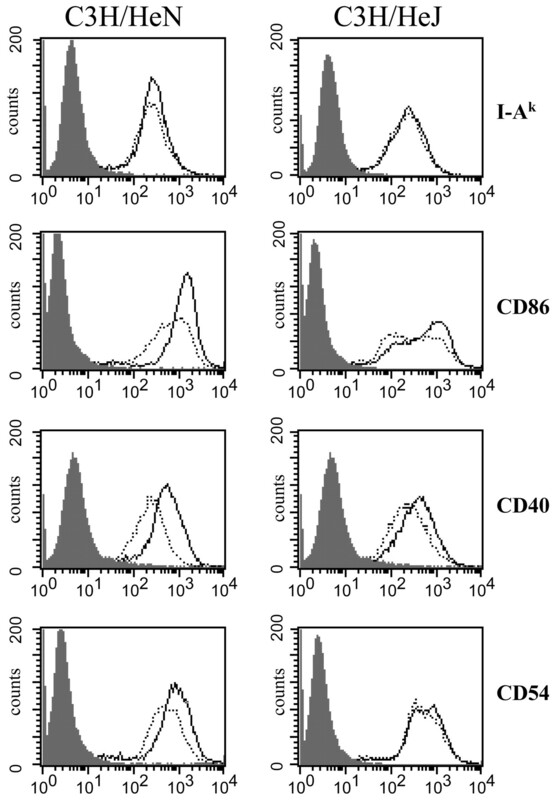 For both stimuli, not all cells of the MHC IIhighCD40high phenotype also expressed high levels of CD86, demonstrating that a part of these cells differently expressed CD40 or CD86. Modulation of immature and mature subpopulations of BMDC by LPS and HSP60. BMDC were prepared from BALB/c mice and were treated or not with 1 μg/ml LPS or 30 μg/ml HSP60. After 18 h, nonadherent cells were harvested and stained for I-Ad, CD86, and CD40 before FACS analysis. Isotype controls were used to set quadrant lines (straight lines). The rectangle (broken line) shows the region of mature BMDC (MHC class IIhigh, CD86high, or CD40high) and the respective percentage of total cells. The data are representative for five experiments. To examine whether HSP60-induced maturation of BMDC is paralleled by cytokine release, supernatants of BMDC from BALB/c mice were tested for cytokine contents by ELISA. Because cytokine release by BMDC varied from experiment to experiment, the cytokine content in LPS cultures was set as 100% (positive control) and the cytokine content in the remaining cultures was expressed as a percentage of the positive control. Untreated cells spontaneously released minute amounts of IL-1β and IL-12(p40), whereas TNF-α, IL-12(p70), and IL-10 were undetectable (Fig. 3⇓). A concentration of 0.3 μg/ml HSP60 failed to induce cytokine secretion whereas 3 μg/ml HSP60 stimulated BMDC for release of considerable amounts of IL-1β and IL-12(p40) and of lower levels of TNF-α and IL-12(p70) (Fig. 3⇓). Cells stimulated with 30 μg/ml HSP60 secreted amounts comparable to LPS treatment and additionally IL-10. 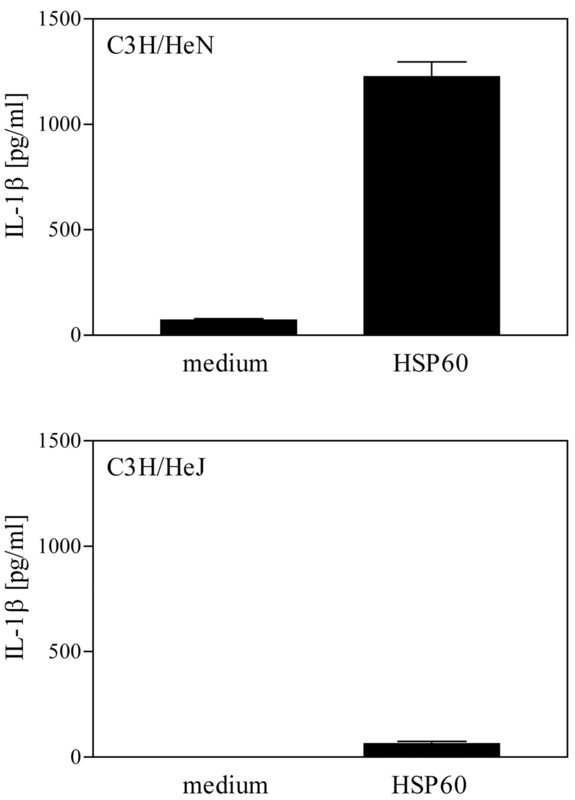 However, HSP60 induced significantly less IL-10 than LPS. Cytokine release of BMDC after treatment with LPS or HSP60. BMDC were prepared from BALB/c mice and were treated or not with 1 μg/ml LPS or 0.3–30 μg/ml HSP60. After 18 h, nonadherent cells were harvested and the contents of TNF-α (A), IL-12(p40) (B), IL-12(p70) (C), IL-1β (D), and IL-10 (E) were determined using ELISA. Values indicate the percentage of cytokine contents in comparison to cytokine levels found in LPS cultures (set as 100%). The data show the mean ± SD from three experiments. Supernatants of BMDC treated with LPS contained 3.9 ± 1.8 ng/ml TNF-α, 798 ± 212 pg/ml IL-1β, 24.2 ± 5.8 ng/ml IL-12(p40), 268 ± 67 pg/ml IL-12(p70), and 421 ± 19 pg/ml IL-10 (mean ± SEM). To test whether a potential contamination of our HSP60 preparation with LPS might be responsible for maturation upon stimulation with HSP60, LPS and HSP60 were treated with PmB before addition to BMDC of BALB/c mice. In positive controls, PmB was omitted. Unstimulated cells were used as negative control. After 18 h, the surface expression of CD86 as a representative marker for DC maturation was determined. 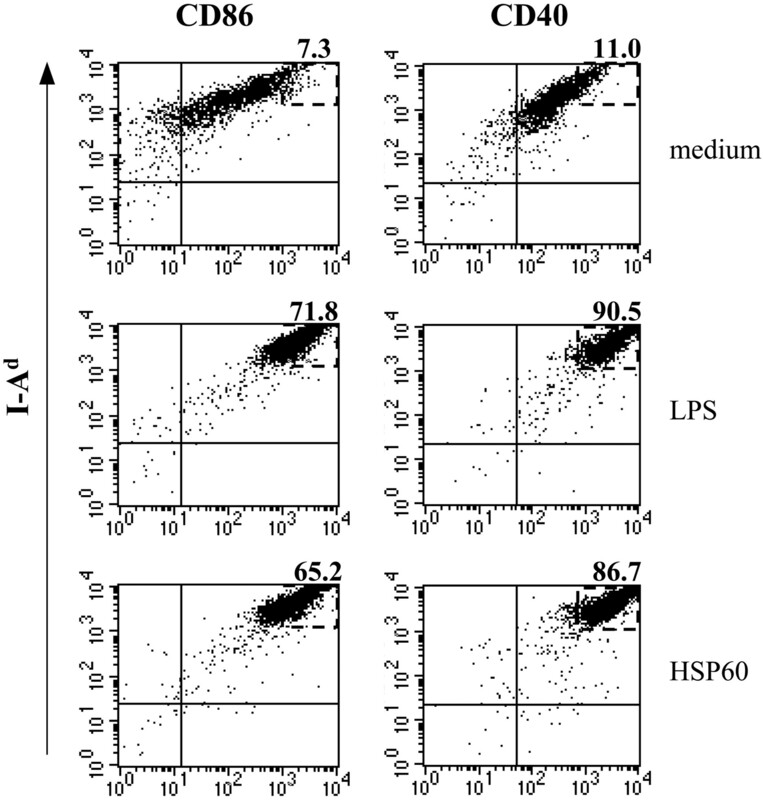 Native LPS and HSP60 induced up-regulation of CD86 (Fig. 4⇓, A and B) when compared to untreated cells. Pretreatment of LPS with PmB completely inhibited the LPS-mediated maturation of BMDC (Fig. 4⇓A). In contrast, the stimulatory capacity of HSP60 for up-regulation of CD86 was not affected significantly by previous treatment with PmB (Fig. 4⇓B). Effect of PmB on LPS- and HSP60-induced maturation of BMDC. BMDC of BALB/c mice were stimulated with 10 ng/ml LPS (A, solid line), with 10 μg/ml HSP60 (B, solid line), or with the respective stimuli previously treated with PmB (broken line). The dotted line shows untreated cells. C, BMDC were stimulated with 10 μg/ml HSP60, with 10 μg/ml HSP60 plus 10 ng/ml LPS previously treated or not with PmB for 18 h. Nonadherent cells were stained for CD86 and analyzed by FACS. D, BMDC were stimulated with 1 ng/ml, 10 ng/ml, and 1 μg/ml LPS previously treated or not with PmB. Controls were left untreated. After 18 h, cells were harvested, stained for CD86 and analyzed using FACS. Data show mean fluorescence intensities (MFI) relative to medium control (set as 100%). MFI of the isotype control was 2.0. The data are representative for two experiments. To test whether putative binding of LPS to HSP60 might inhibit its interference with PmB, BMDC were stimulated with a mixture of HSP60 and LPS in the absence or presence of PmB. Untreated and HSP60-stimulated cells served as negative and positive control, respectively. After 18 h, cells were stained for surface expression of CD86 and analyzed by FACS. Expression of CD86 was enhanced by 3.7-fold upon stimulation with HSP60 alone and was further increased by additional LPS (Fig. 4⇑C). However, previous treatment of the HSP60/LPS mixture with PmB resulted in levels comparable to the positive control. At the experimental conditions used, PmB suppressed the bioactivity of up to 1 μg of LPS/ml (Fig. 4⇑D). Therefore, the PmB concentration used was well in excess of the calculated endotoxin content of HSP60. In addition, the effect of boiling LPS and HSP60 on its ability to induce maturation of BMDC was analyzed. Therefore, LPS and HSP60 were boiled or were kept at room temperature and subsequently were added to BMDC cultures of BALB/c mice. Untreated cells served as control. In order to make use of another endpoint of BMDC maturation, TNF-α levels were determined in the supernatants using ELISA. BMDC stimulated with boiled LPS released similar levels of TNF-α as cells stimulated with nonboiled LPS (Fig. 5⇓) because LPS is not sensitive to heating. 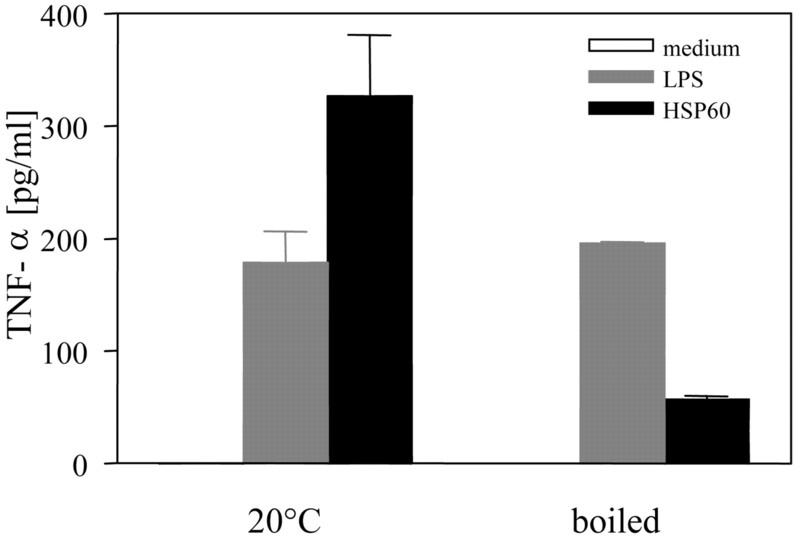 However, boiling of HSP60 clearly reduced TNF-α secretion when compared to the response to nonboiled HSP60 (Fig. 5⇓). Effect of heat-denaturation on LPS- and HSP60-induced TNF-α release. BMDC of BALB/c mice were stimulated or not with 10 ng/ml LPS or 10 μg/ml HSP60 or with boiled LPS or HSP60. After 18 h, nonadherent cells were harvested and TNF-α levels in the supernatants were analyzed using ELISA. Error bars indicate half of the difference between both values of duplicate cultures. To further examine whether the activity of our HSP60 preparation was borne by protein rather than by a contaminant, the HSP60 preparation was subjected to treatment with proteinase K. Therefore, medium, LPS, and HSP60 were treated with proteinase K- or protein G-coupled agarose beads before addition to BMDC of BALB/c mice. After 18 h, surface expression of MHC class II, CD86, and CD40 was analyzed by FACS. Pretreatment of LPS or HSP60 with protein G did not affect the ability of both compounds to induce maturation of DC (Fig. 6⇓, A and B). Also, incubation of LPS with proteinase K did not diminish its activity on DC (Fig. 6⇓A). By contrast, proteinase K treatment of HSP60 strongly decreased the expression of all three markers down to medium control values (Fig. 6⇓B). The comparison of two different concentrations of HSP60 showed that proteinase K treatment suppressed the BMDC stimulatory activity of HSP60 to the same background level, which argues against a proteinase K-resistant bioactive contaminant in the HSP60 preparation. Effect of proteinase K digestion on LPS- and HSP60-induced maturation. Medium (grey lines), LPS (A, black lines), and HSP60 (B, black lines) were treated with proteinase K- (solid line) or protein G- (broken line) coupled agarose and subsequently added to BMDC cultures. After 18 h, cells were harvested and expression of I-Ad, CD86, and CD40 was determined by FACS. C, Mean fluorescence intensities (MFI) of CD86 staining from BMDC treated with 10 or 30 μg/ml native or proteinase K-digested HSP60. The functional significance of HSP60-mediated DC maturation was tested in an allogeneic T cell activation assay. When compared to medium controls, BMDC treated with 3 or 30 μg/ml HSP60 induced allogeneic T cell proliferation while 0.3 μg/ml HSP60 was ineffective (Fig. 7⇓A). Supernatants of allogeneic T cell assays contained low amounts of IFN-γ (Fig. 7⇓B) and IL-12(p40) (Fig. 7⇓C) when untreated DC had been used as stimulators. However, considerable amounts of these cytokines were found after previous stimulation of DC with HSP60 at concentrations >0.3 μg/ml. The release of IFN-γ and IL-12(p40) correlated with the HSP60 concentration required for maturation of BMDC (Fig. 7⇓, B and C). In the absence of T cells, HSP60 did not stimulate BMDC for IFN-γ secretion (data not shown). In contrast, determination of Th2-type cytokines revealed low levels of IL-10 in cultures containing DC treated with 30 μg/ml HSP60 (Fig. 7⇓D) but the absence of IL-4 in all cocultures (data not shown). In conclusion, BMDC treated with HSP60 are potent inducers of allogeneic T cell proliferation associated with a bias toward the production of IFN-γ and IL-12(p40). Capacity of BMDC treated with HSP60 for allogeneic T cell stimulation. BMDC were prepared from BALB/c mice and were stimulated or not with 0.3–30 μg/ml HSP60. After 18 h, nonadherent cells were harvested and graded numbers of mitomycin C-treated BMDC were cocultured with allogeneic T cells from C57BL/6 mice. After 3 days, cells were pulsed with [3H]thymidine overnight and incorporated radioactivity was determined (A) or supernatants were tested for the presence of IFN-γ (B), IL-12(p40) (C), and IL-10 (D). Data are representative for at least two experiments. Error bars indicate SD of triplicates (A) or half of the difference between both values of duplicate cultures (B–D). To address the question of whether TLR4 signaling is also involved in HSP60-mediated cytokine release and maturation of DC, the response of BMDC from C3H/HeN and TLR4-mutant C3H/HeJ mice (33) was compared. BMDC of C3H/HeN mice released substantial amounts of IL-1β after stimulation with HSP60 whereas BMDC of C3H/HeJ mice secreted minute amounts of this cytokine (Fig. 8⇓). FACS analyses revealed that 3 μg/ml HSP60 induced up-regulation of the costimulatory molecules CD86, CD40, and CD54 but only weak modulation of MHC class II molecules on BMDC of C3H/HeN mice (Fig. 9⇓). TLR4-defective BMDC of C3H/HeJ mice slightly up-regulated surface expression of CD86 and CD40, but not of MHC class II and CD54, molecules in response to 3 μg/ml HSP60 (Fig. 9⇓). Thus, TLR4 is involved in HSP60-mediated maturation of BMDC. TLR4-dependent release of IL-1β from BMDC in response to HSP60. BMDC of C3H/HeN and C3H/HeJ mice were stimulated or not with 3 μg/ml HSP60. After 18 h, nonadherent cells were harvested and IL-1β was determined using ELISA. Data show mean ± SD of triplicates and are representative for two experiments. TLR4-dependent maturation of BMDC in response to HSP60. BMDC of C3H/HeN and C3H/HeJ mice were stimulated or not with 3 μg/ml HSP60. After 18 h, nonadherent cells were harvested and stained for I-Ak, CD86, CD40, and CD54. Isotype control staining is shown as grey shaded area. Broken lines represent untreated cells, solid lines show HSP60-treated cells. Data are representative for two experiments. Cytoplasmic extracts of untreated cells and cells stimulated with 10 ng/ml LPS or 3 μg/ml HSP60 for 15 and 45 min were prepared and were analyzed for the phosphorylated forms of IκB, p38 MAPK, ERK1/2, JNK, and raf-1 by sequential Western blots. Only basal levels of all phosphorylated kinases and IκB were detected in untreated cells after 15, as well as after 45, min (Fig. 10⇓). 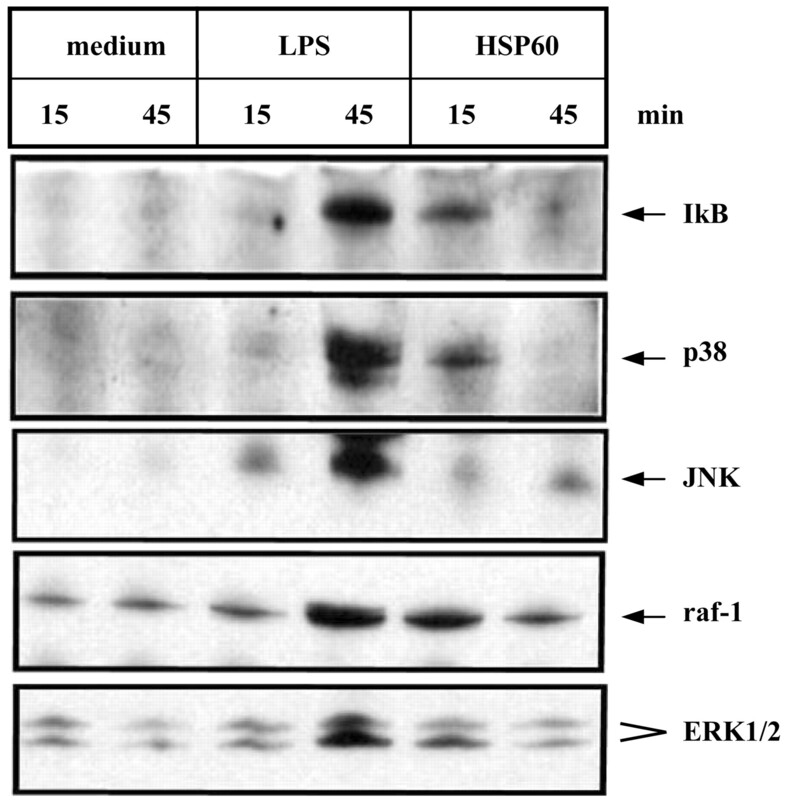 As expected, LPS induced phosphorylation of IκB, p38 MAPK, JNK, raf-1, and ERK1/2 after 45 min (Fig. 10⇓). HSP60 induced phosphorylation of IκB, p38 MAPK, raf-1, and ERK1/2 much more rapidly with peak levels already after 15 min. After 45 min, phosphorylation of these molecules decreased to the basal level (Fig. 10⇓). Thus, HSP60 induces phosphorylation of signaling molecules of the MAPK pathway and of IκB similar to LPS but with strikingly different kinetics. Signaling pathways in BMDC stimulated with HSP60. BMDC were prepared from BALB/c mice and were treated or not with 10 ng/ml LPS or 3 μg/ml HSP60. After 15 and 45 min, cytoplasmic extracts were prepared from nonadherent cells and analyzed for the phosphorylated forms of IκB, p38 MAPK, JNK, raf-1, and ERK1/2 by Western blot. 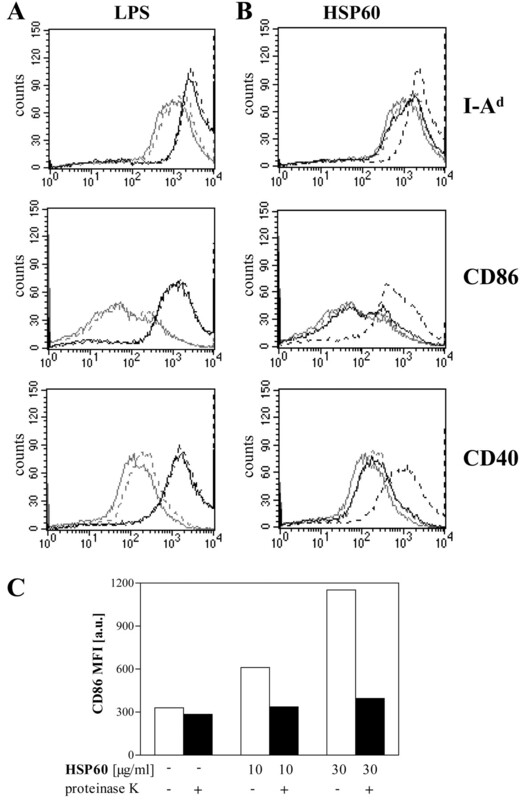 Maturation of DC induced by human HSP60 was characterized by up-regulation of MHC class II and of the costimulatory molecules CD40, CD54, and CD86. However, a fraction of cells expressed only CD40 in conjunction with MHC class II molecules. In parallel, proinflammatory or Th1-type cytokines like TNF-α, IL-1β, and IL-12, and also the Th2-type cytokine IL-10, were secreted. Cytokine release and maturation of BMDC in response to HSP60 were dose-dependent suggesting classical ligand-receptor interactions as the cause of DC stimulation. At low concentrations (0.3 μg/ml), DC neither up-regulated surface markers nor released cytokines. Both functional properties were induced by 3 μg/ml HSP60 and hence shared threshold concentrations. At very high concentrations (30 μg/ml), DC released similar amounts of the Th1-type cytokines as observed in response to LPS. However, IL-10 levels were <50% of those seen in response to LPS. IL-10 is of special relevance in the feedback inhibition response to Th1-type reactivity (34). Indeed, we observed that HSP60-stimulated DC induced a clear Th1 bias in allogeneic T cell cultures. Again, the threshold for HSP60 effects in the allogeneic T cell assay was between 0.3 and 3 μg/ml. This suggests that there is only one type of interaction between HSP60 and putative receptors on DC which regulate in a similar way DC maturation, cytokine secretion, and T cell help. Previously, the stimulatory activity of HSP70, HSP90, and gp96 on the release of proinflammatory cytokines and/or up-regulation of costimulatory molecules by cells of the innate immune system has been described (35, 36, 37). Although these HSP molecules differ in structure and cellular localization from HSP60 that was examined in the present study, they elicit similar responses by APCs. The nature of HSP receptors and HSP-induced signal transduction is not yet completely understood. Recently, CD91 has been identified as the receptor for HSP70, gp96, HSP90, and calreticulin (38). With regard to HSP60, we and others have shown that CD14, TLR2, and TLR4 are involved in signal transduction in macrophages (15, 16, 17). For DC, we found in this study that TLR4 is a major mediator of HSP60-induced signal transduction for maturation and cytokine release. DC of C3H/HeJ mice with defective TLR4 failed to release substantial amounts of IL-1β as found in supernatants of C3H/HeN DC after stimulation with HSP60. However, C3H/HeJ BMDC were not completely unresponsive to HSP60 as evident from slightly increased expression of CD40 and CD86. This finding suggests that HSP60 elicits a different type of signal from the mutated form of TLR4 in C3H/HeJ DC or that there is a TLR4-independent pathway of HSP60 signaling. The latter assumption is supported by our own observation that HSP60 binds to macrophages of TLR4−/− mice (18). The characterization of the putative receptor is currently in progress. So far, there exists no information about signaling pathways involved in HSP60-mediated activation of DC. In this study, we describe for the first time that upon stimulation of DC with HSP60, the MAPK pathway including phosphorylation of p38 MAPK, JNK, and ERK1/2 is activated. ERK1/2 is activated by the upstream kinase MAPK kinase 1 (39). The MAPK kinase 1/ERK1/2 signaling cascade in turn is controlled by raf-1 kinase (40, 41). Thus, the finding that HSP60 activate raf-1 kinase in DC corroborates the finding of ERK1/2 activation. Upon stimulation with HSP60, ERK1/2 activation might protect DC from apoptosis as shown for DC stimulated with LPS (42) whereas p38 MAPK activation might result in up-regulation of surface molecules and cytokine secretion in response to HSP60 as observed in LPS-stimulated DC (42, 43). In addition, signal transduction of HSP60 in DC seems to enhance translocation of NF-κB into the nucleus and might be responsible for DC maturation as shown for LPS-stimulated DC (42). This was shown indirectly by increased phosphorylation of IκB. NF-κB is involved in the gene transcription of several proinflammatory cytokines like TNF-α or IL-1β. TLR4 is strongly associated with the NF-κB signaling pathway supporting its role in HSP60 signal transduction. Indeed, after stimulation of macrophages with HSP60, TLR4 engagement has been shown to proceed via activation of IκB kinase that is responsible for release of NF-κB after phosphorylation of IκB (17). Thus, release of TNF-α and IL-1β and up-regulation of CD86 of DC in response to HSP60 might be caused by TLR4-mediated NF-κB activation. Additionally, there exist cross-talks between the NF-κB and MAPK pathways since p38 MAPK and ERK1/2 were found to mediate NF-κB activation (44, 45). Such alternative pathways could be responsible for the HSP60-induced increase of costimulatory molecules in the absence of an intact TLR4 signaling domain as was observed on C3H/HeJ BMDC. As in previous studies with recombinant stress proteins, the human HSP60 preparation used in this study showed weak reactivity in the LAL assay which may indicate traces of LPS. Therefore, we performed several different types of experiments to examine whether LPS contamination is responsible for HSP60-mediated maturation of BMDC. We can exclude free LPS as causative reagent because PmB did not affect the response to HSP60 alone but did block free LPS or LPS added to HSP60. Experiments with heated or protease-digested HSP60 revealed that the activity of our HSP60 preparation was dependent on intact protein structure. Certainly, one might speculate that HSP60 serves as a carrier and enhancer molecule for minute amounts of LPS. This hypothesis implicates that PmB cannot neutralize LPS when bound to HSP60. Thus, addition of LPS to our HSP60 should result in increased, but PmB-insensitive, activation of BMDC. However, we found that PmB completely blocked the activity of additional LPS. The only possible explanation for why supplemented LPS could be fully neutralized by PmB is that our HSP60 preparation was saturated with LPS so that additional LPS could not bind to HSP60 and, thus, could be detected by PmB. However, this is unlikely since some batches of HSP60 showed higher reactivity in the LAL indicating that there exist more hypothetical binding sites in the HSP60 preparation used in this study. In this context, it should be noted that HSP60 binds to a not-yet-defined receptor distinct from the LPS receptor TLR4 (18) and that the biological activity (induction of TNF-α secretion) of HSP60 can be blocked by Abs to HSP60 (C. Habich, unpublished observation). Moreover, we observed differences between DC treated with HSP60 vs LPS. For instance, the pattern of cytokine secretion differed. At concentrations of HSP60 (e.g., 30 μg/ml) and LPS (e.g., 1 μg/ml) that induced comparable amounts of the Th1-type cytokines IL-12 and TNF-α, the secretion of the counterregulatory cytokine IL-10 was reduced by >2-fold. This might result in a Th1 bias in response to HSP60. In addition, the kinetics of phosphorylation of signaling molecules differed between HSP60 and LPS. These are all indirect hints that the stimulatory capacity of HSP60 is not dependent on bound LPS. However, for the final proof that the hypothetical interference between HSP and LPS must be destroyed completely, both molecules must be separated and it must be shown that the LPS-free HSP60 is still active. However, methods for interrupting LPS binding are so harsh that the stimulatory part of the HSP60 molecule could be irreversibly destroyed. This could lead to a false assumption that HSP60 loses its activity in the absence of LPS. Suitable methods for such studies should be established within the next years. Even if it may not apply to the present study, the concept that HSP60 may serve as a carrier for microbial- or necrosis-associated lipophilic compounds, followed by presentation to the TLR family, is intriguing and should not be overlooked. Indeed, plasma concentrations of endotoxin are 100 pg-1 ng/ml between gut and liver, and thereafter 5–20 pg/ml remain in circulation (46). Binding of LPS to human HSP60 should also occur in vivo. Taken together, maturation of DC is strongly induced by human HSP60 and paralleled by release of Th1-promoting cytokines. These findings provide an explanation for the dichotomy of HSP60-mediated effects in vivo. The benefit of HSP60-mediated Th1 development would be the capacity to serve as natural adjuvant in protection from cancer or infectious diseases. In contrast, such a property of HSP60 might favor the development of Th1-dependent organ-specific autoimmune diseases in cases when endogenous HSPs are released as observed in diabetes and arthritis (47, 48). We thank Dr. Dana Elias (Peptor) for providing recombinant human HSP60. We thank Waltraud Fingberg for technical assistance and Volker Burkart for discussion of the data. ↵1 This work was supported by Grant SFB503/A2 from the Deutsche Forschungsgemeinschaft, by the Bundesminister für Gesundheit and the Minister für Schule, Forschung und Wissenschaft des Landes Nordrhein-Westfalen. ↵2 Current address: Department of Surgical Research, University Hospital of Essen, Essen, Germany. ↵4 Abbreviations used in this paper: HSP, heat shock protein; TLR, Toll-like receptor; JNK, c-Jun N-terminal kinase; MAPK, mitogen-activated protein kinase; DC, dendritic cell; BMDC, bone marrow-derived DC; LAL, Limulus amebocyte lysate assay; CM, culture medium; PmB, polymyxin B; ERK, extracellular signal-regulated kinase.